VISTA–John and Roberta Koch rarely eat out anymore. The prices are too high for retirees on a fixed income, and the taste doesn’t always measure up to the cost. The Vista couple does enjoy coming to a weekly lunch at St. Francis of Assisi Catholic Church in this northern San Diego County city. As they awaited their order of two teriyaki burgers with pineapple, Roberta Koch, 74, picked up some fresh carrots, beets and green beans from a side table. She planned to use the carrots for a beef stew for dinner. Her husband, John, a 78-year-old retired Marine, said he likes the companionship and atmosphere of meeting other area seniors regularly at the Wednesday lunches. But many older Californians simply don’t have enough to eat. California is a leading state in which seniors have become among “the hidden poor,” according to a 2015 study by the UCLA Center for Health Policy Research. Nearly 1 in 5, or about 772,000, of California’s adults older than 65 cannot afford basic needs such as food, housing, transportation and health care, but often do not qualify for public assistance, the study found. “If you’re running out of money at the end of the month … the easiest thing is to cut down on food or eat food that is inexpensive or not nutritious,” said Steven Wallace, associate director of the UCLA Center for Health Policy Research and co-author of the report. Food insecurity is rising among California’s low-income seniors, according to the California Health Interview Survey, also conducted by the UCLA Center for Health Policy Research. In 2009 and 2010, 21 percent of Californians age 65 and older whose income was less than 200 percent of the federal poverty level reported being unable to afford enough food compared with 27 percent in 2013 and 2014, the survey found. That’s a serious problem because many seniors need medications that must be taken with food, and the risk of diabetes increases with age, Wallace said. Concern about senior poverty grew nationwide after the financial downturn of 2008, when many people near or at retirement age lost their jobs or homes, saw savings wiped out or pensions cut, and as baby boomers started to retire. State lawmakers in June passed a slight increase for the state portion of Supplemental Security Income funding, money that helps the disabled and low-income elderly, but the funding still falls below what it was before cuts in 2009. 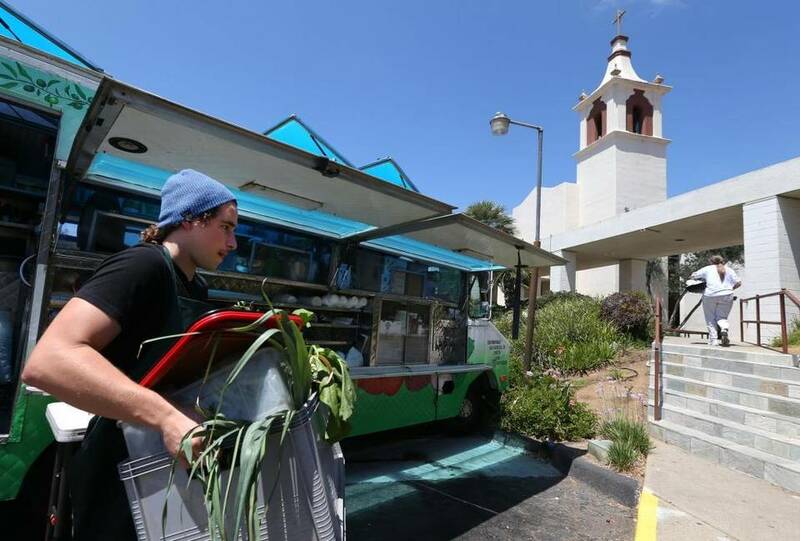 The food at St. Francis of Assisi arrived in a green and white food truck that stopped by the church’s entrance. Soon, the smell of chicken and beef cooking wafted from the mobile kitchen as volunteers began to unload fresh broccoli, bananas and more. Besides the Vista church, the truck stops at mobile home parks in Oceanside and San Marcos on other days of the week. The aim is to help feed a growing number of the region’s older adults with healthy, affordable meals and combat leading problems facing seniors such as poor nutrition and social isolation. To improve access to services for a vulnerable population, the Rancho Santa Fe Foundation, along with the nonprofit Dreams for Change and Interfaith Community Services, launched the North County Seniors Connections program in 2014. The foundation bought the food truck for $32,000 and will provide $750,000, through its funds and other donors, over three years for the program. Seniors can pay $2 for lunch or eat free with a CalFresh card. Additionally, Interfaith provides speakers, classes and sometimes music for the group. Dickinson Farm of National City donates free produce such as beets, carrots, kale and turnips for seniors to take home. “It basically becomes a senior center on wheels,” said Debbie Anderson, programs director for the Rancho Santa Fe Foundation. The food truck idea grew out of a study the foundation commissioned from the University of San Diego’s Caster Family Center for Nonprofit and Philanthropic Research. The study found that many seniors in the region were not using services because of lack of access. While the target group is ambulatory seniors, people like to go to places that are familiar and not too far, such as their church or the community room of the mobile home park where they live, Anderson said. And there are many low-income seniors in northern San Diego County. In Vista, about 24 percent of the city’s 65 and older population have incomes that are less than 200 percent of the federal poverty level, the study found. The percentages are higher in Oceanside and San Marcos. Helping to create “a more dignified experience,” seniors can choose what meal they want from the menu, and the food is prepared on the truck, said Teresa Smith, CEO of Dreams for Change, which runs the food truck. Austin O’Malley, 82, of Escondido said he comes to lunch at his parish to see friends – part of his prescription for a long, healthy life. The social component also draws Charlene Fretwell, 89, a retired federal service clerk who lives in a mobile home park in San Marcos. She recently lost the last of her three children. Alicia Enriquez, 67, is a retired caregiver who relies on SSI. She is diabetic and struggles to pay her mortgage, utilities and car expenses each month. The lunches at the church help because they’re healthy, she said. This entry was posted in CA Farm To Fork website on July 21, 2016 by California Farm to Fork.